These are the two most recent blog entries by an anonymous Syrian woman, reprinted from the UK site, Open Democracy, where her blog entries appear on a weekly basis. Rita is an opposition activist living in Damascus. However, with rumours of considerable sums of money transferred to the private bank accounts of some FSA colonels via foreign parties, there is a mounting suspicion amongst activists and the Syrian public that the goals and policy of the FSA have changed. 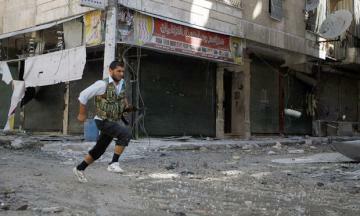 The FSA battalions switched from defensive to offensive manoeuvres – targeting military bases and specific officials. 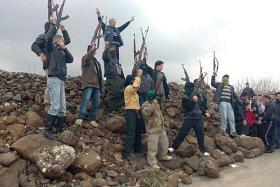 Violence escalated, and the communities which had been sheltering the FSA fell under siege. Lack of basic foodstuff and fuel supplies, daily bombardments and massacres have become part and parcel of the permanent landscape of suffering. Most of the residents in these areas fled their homes and became refugees, while many others were killed. This has created a feeling of resentment and anger against FSA policy. Lack of communication between FSA foot-soldiers, activists and the Syrian public means that all have difficulty understanding what the FSA’s military strategy is. This mistake has been repeated over and again in cities all over Syria. 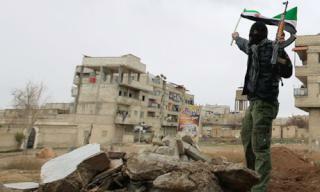 Failure to learn on the part of the FSA has compelled many inside Syria to take a negative position towards it. This is why a month ago people in the Al-Midan neighbourhood of Damascus asked the FSA fighters to leave it, as their houses became possible targets for regime forces. This happened despite the fact that most people in Al-Midan totally supported arming the revolution. Abu Khaled, before the revolution, was a successful businessman from the suburb of Douma. He was a supporter and a sponsor of the FSA. He lost his factory and many other properties in the massive shelling on the city and has now moved with his family to a small apartment in Damascus. He had no comment to make on this subject except to invoke a phrase which is only used at times of great anxiety: ” la hawl wa la quwwa illa billah” which means “there is no transformation or power, except by [the will of] God””. The lack of any clear strategy by the FSA in Douma has left many like Abu Khaled disillusioned. “I just want to continue my life” Raghda told me. Raghda had lost her job at a small publishing house after her neighbourhood had been shelled and invaded several times. “I don’t see an end to this armed conflict. I agree with the rightful demands of the opposition, but if this means bringing a halt to my life then I will stand against them”. A dangerous problem has emerged. The sound of gun-fire and mortars is the loudest voice on the ground. The voices of the diverse protest movements, which made up the opposition on the ground in Syria, have been drowned out by the FSA. 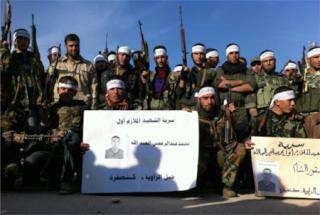 Activists and advocates for non-violence, who remain in Syria today, feel marginalised and useless. The sense of impotence is accentuated given that a considerable number of activists who had provided impetus to the protest movement in the spring of last year have now left Syria, or are languishing in the prisons of al-Assad. This has given the pro-regime media channels a golden opportunity to blacken the names of all opposition activists. Secularists and Islamists alike have long suffered under the shadow of autocratic rule. What is required now is the strength and courage to actively integrate and mix so that we can be rid of the corrosive prejudices which threaten what this revolution stands for. The Syrian street has grown accustomed to mocking the outcomes of meetings between representatives of Arab countries at any level. Our “so-called” representatives have often been found wanting in their ability to find consensus. On such occasions daily news headlines may well be prefaced with, “The Arabs have agreed to disagree”. This has deprived the people in the region of having any meaningful platform which carries weight in international forums. This paralysis can be attributed to the fact that all Arab dictatorships are subservient to external parties, making them unable to take any decision in the national interest. But now it seems that this curse has spread to the Syrian people as well – agreeing not to agree at a time when we desperately need to unite our ranks. This divergence of views throws up a couple of interesting questions: is this proclivity to squabble symptomatic of multiple international actors intervening in the Syrian conflict or is it, as some political commentators would have it, attributable to Syrians actually not being intellectually ready for democracy and pluralism? The Syrian Revolution has gathered under its wing a wide cross-section of Syrian society, all opposed to the system of authoritarian rule. However, the divisions amongst this broad array of actors have continued to be the true master of the situation. Since the start of the revolution, the Syrian opposition abroad has witnessed sharp divisions and has been hitherto unable to demonstrate complete unity in its ranks to the extent that even the wording of press releases are not agreed upon. Personal differences are prevalent, creating a climate of frustration among the opposition at home. Despair at the in-fighting and rivalries amongst opposition elements has completely overwhelmed people at home. A more recent and disturbing development has been the re-emergence on the ground of a rivalry between Islamists and secularists in Syria. Evidence of the extent of this cleavage can be found on a number of social networking pages. Islamists, who make up the vast majority of the Free Syrian Army (FSA), point an accusatory finger at secularists for not taking up arms. Islamists – and here I mean the Sunni community – consider themselves to have been the ones who have borne the heaviest burden and suffered the largest losses in the revolution to date. Thus, you can find among the Sunni community a general feeling that they are the vanguard and have the right to lead the many different groups and sects which make up the Syrian street. Jamal belongs to the Ismaili sect. His anti-regime credentials are as good as any – he had been arrested twice for a period exceeding six months for his role in documenting and participating in peaceful protests. Despite this, Jamal felt it necessary to pretend to be Sunni to gain acceptance into the FSA: “I’ve started practicing Sunni rituals even though I still consider myself Ismaili. 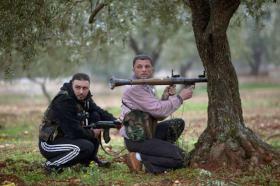 I had to, so that I could engage in combat and be a part of the FSA.” He told me. Recent developments provide us with a stark reminder of this struggle between Secularists and Islamists for the soul of the revolution. Approximately one month ago elements of the FSA cut off the water supply to Selemiyeh and its surrounding villages, because the predominantly Ismaili population refused to carry arms and continued to adhere to the principle of peaceful protest. This collective punishment on the part of the FSA seemed all the more shocking given that that Selemiyeh has provided refuge to more than 80,000 people, mostly from the Sunni community, who have been forcibly displaced from the nearby war-ravaged cities of Hama and Homs. How do we proceed with the revolution – peaceably or by means of an armed struggle? The question here is why do Islamists and secularists feel they are in opposing camps? When I asked a few young fighters from the Ali bin Abi Talib battalion of the FSA what they understood by the term secular, they gave a terse reply: “Secularism is contempt for our faith and it means we cannot practice our religion freely.” Of course this is not how secularists in Syria, like myself, understand the term. For me, the separation of state from religion follows the popular slogan “religion is for God and the homeland is for all.” It means that the freedom of religion, like other freedoms is sacred. At the same time, it also means that religion cannot control the policies of the state and should not define its national identity. It is a recognition that the homeland we call Syria is made up of numerous faith communities and a celebration of plurality which is not at the expense of any one group. When I asked a gathering of young secular Syrians on a Facebook forum why there was so much fear concerning Islamists, the response drew striking parallels with how similarly aged members of the FSA had viewed secularists. “The Islamists want to impose Islamic law on us and prevent us from exercising our personal freedoms.” Islamic law, of course, does not mean this. Justice, ethics and religious freedom are the cornerstones of Islamic Law. This is neatly encapsulated in the well-known quote from the Qur’an: “There is no compulsion in religion”. The Noble Qur’an and the Sunnah of the Prophet – on which Islamic Law is based – gave people the complete right to follow whichever faith they want. When the law imposes a system of Islam on minorities, this does not mean that it is an Islamic regime but an autocratic dictatorship. For the FSA to follow this path would be a betrayal of the revolution it originally set out to defend and protect. We would only be substituting one despotic regime for another.